I’m excited to kick off the new year with a special guest blogger, Kirsty Farrugia from ‘Feels Like Home Professional Organisers’. I don’t know about you, but as a working mum with a toddler at home, I’m often struggling to find the time and energy to keep my house looking tidy…and I’m one of ‘those’ people who only really clean when we have guests coming over! Feel free to contact Kirsty if you’re seeking assistance with your family home! As a working mum, I totally understand the demands of juggling a successful career and homelife. I have been running my own business for the last four years whilst simultaneously raising two children and trying to enjoy a beautiful marriage, all amidst the pressure to be the perfect superwoman in our sometimes crazy culture. In my world people come before things, however household chores are a necessary aspect of caring for my family and friends. As a Professional Organiser who tries to practice what I preach, here are my tips for managing household chores whilst running a business. Housework can be delegated; you don’t need to prove that you are a superwoman or supermum by doing absolutely everything yourself. Get your partner to help, get your children on board or, if your family budget allows, why not consider outsourcing some of the tasks? Our children are far more capable than we often give them credit for. Do a Google search for a “kids chores chart”, consider personalising it and start getting your kids to step up. You can tie it to pocket money or just tell them that this is the new family way of doing life together. ‘Team Farrugia’ is a mantra at our house. There are a myraid of service providers that can help for those who can afford it. Outsource the cleaning, the ironing, the dinners, the grocery shopping, anything that will lighten your load and is within your budget. 2. Just do it now! This little saying has helped me enormously over the years and one that I often use to encourage my clients; to great success. It can be applied to almost anything. Just do the dishes now, put the clothes away now, book the cleaner now (did you see what I did then ;-)). Procrastination can be all consuming if you let it! Think of all the headspace you’d create for the things you enjoy by doing things now and eliminating the mental ‘post it notes’ stuck all around your mind for all the things you need to get to! Regardless of your situation, I highly recommend blocking out time in your weekly schedule for housework – we do it at work, why not do it at home? If it’s in your diary and you commit yourself, then you’ve given yourself the best chance of getting it done. I block out a few hours every Monday morning to clean the bathrooms and mop the floors; having delegated the vacuuming to hubby :). You could do something similar and get it all done in one block or schedule things across the week but lock it in, whatever works for you. On the weeks that go a bit pear shaped (and that happens to all of us), I rearrange my schedule to fit it in somewhere else as it is one of my non-negotiables. This frees my mind so that I’m not always wondering and feeling guilty about when I’m going to get to the housework. Ok, so this tip might stretch to 10 minutes or even half an hour depending on your day. Personally, I make it a rule to not sit down to work or watch TV until all the little jobs are finished. That is, the washing is away, dishes done as well as any other odd jobs that have accumulated over the day. The quick blitz really helps. Ideally, you’d get your family to help with this before they relax because you’ve delegated and taught them to just do it now :). You can make it a game or a tradition by setting a timer for 5 (or 10) minutes and get all those jobs done. This again helps with being able to be present in your work or family time as you’re not constantly (consciously or not) thinking about the dishes that need to be done or the clothes that need to be put away or the toy room that needs to be cleaned up. My final tip is to give yourself grace! Roll with the challenging days/weeks, allowing yourself to get back into your routine and schedule as soon as you can. Business, life and kids will be difficult at times, things go wrong, stuff happens to all of us and that’s ok. There are times when each of us feels like we are drowning in the overwhelm. I’m hoping these tips can provide a buffer for you and your family and perhaps help you quickly get back track. You are unique and so is your family so use them as you see fit. 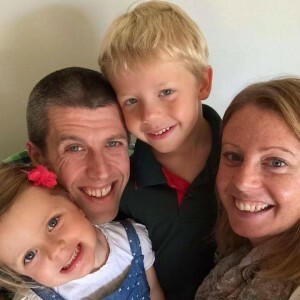 Kirsty Farrugia is a wife to THE most organised man alive and has learnt most of her organisational skill through the osmosis process of living with him for the last 11 years! She is the mother of two cheeky and wonderful children aged 6 and 4. Kirsty has been a Professional Organiser for the last 4 years helping other families organise their houses so it feels like home. You can connect with her on www.facebook.com/feelslikehomepo for more inspiring and practical tips on organising. What Can You Achieve In 100 Days? Powerful SEO Advice from Kate Toon – Sydney’s famous copywriter!